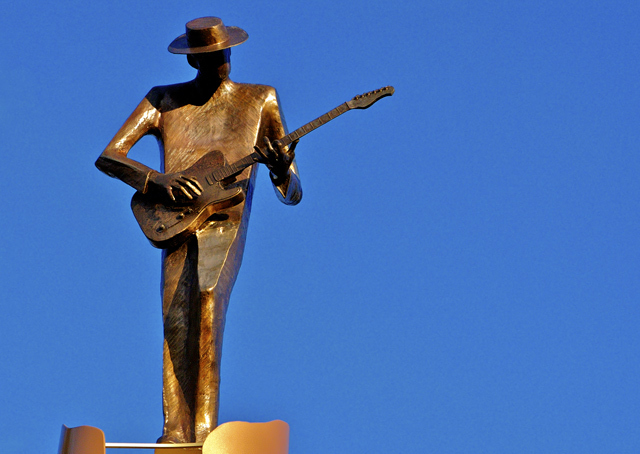 One of four statues located on 47th Street welcoming people to the the (little known) historic landmark called Chicago's Blues District - not a place visited by most tourists - but it should be. Fortunately there wasn't a cloud in the sky which provided interesting morning lighting and also allowed for a nice double meaning with the title. Very nice composition. I would have liked to see this when the sun at a lower position. Proudly hosted by Sargasso Networks. Current Server Time: 04/21/2019 02:08:39 AM EDT.